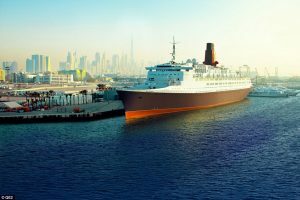 The Queen Elizabeth 2 Hotel is now open for business in Dubai, putting to rest—at least for the foreseeable future—rumors that the great liner might be headed to the scrap heap. The hotel’s opening pleases me greatly. It has also inspired me to suggest my ideal ocean liner-themed holiday. Day 1. Arrive in Los Angeles. Spend the night on Queen Mary in nearby Long Beach. Day 2-3. Uber over to LAX. Take a non-stop flight (First Class, of course) to Dubai. Day 3. 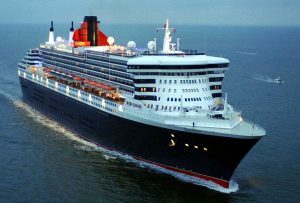 Spend the night on Queen Elizabeth 2. Day 4. Fly from Dubai to Heathrow, and then on to Southampton. Day 5-11. Board Queen Mary 2 for a transatlantic crossing to New York. Day 12. Arrive in Brooklyn Uber over to JFK for a flight to PHX.